Marmion runs in Connacht's fifth against Ospreys. CONNACHT SCRUM-HALF Kieran Marmion has been called into the Ireland Six Nations squad for the remaining two games. And after recovering full fitness he is determined to make the most of his chance. 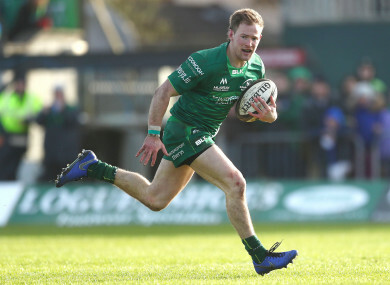 Marmion, 27, is one of six Connacht players involved in the squad for the remainder of the competition, and he replaces his Connacht compatriot Caolin Blade in the squad ahead of the France and Wales championship deciders. It’s his first involvement in the squad since his impressive start against New Zealand last November, after which it was revealed that he had played with an ankle injury that immediately required surgery. But Marmion has wasted little time in reminding Schmidt of his talents. After a replacement role against the Cheetahs and a start against Glasgow he scored two tries in Saturday’s bonus point-win over the Ospreys to show he is nearing his peak form once again. Blade was arguably Connacht’s best player in Marmion’s absence, which then prompted his Ireland call-up. Looking on, Marmion had mixed emotions as his former understudy, John Cooney, also got his chance at international level. “It’s been great and not great, it just drives competition and at the end of the day hopefully it can make me a better player,” said Marmion, before he received word of his Ireland recall. With less than two hours of game-time to his name since his return Marmion will be challenged by the step up in intensity that comes with international rugby. Before his ankle injury, in Schmidt’s eyes firmly second-choice 9 – behind Conor Murray – and a solid performance against the world champions in his 24th international appearance underlined his value. But despite a positive end of year report, Marmion still knows the pressure is on him to play well if he wants to make the cut for the World Cup at the end of the summer. “There’s always competition, it doesn’t matter how well you play, it’s just one game at a time, if you play poorly the next game then you’re done. I don’t take anything for granted. I found out the next day (after the New Zealand game) that I was going to get the surgery but I had to get it right really, it was kind of a problem beforehand. It’s been done now, it’s over and hopefully I can have a good run in at the end of the season. Without Marmion and a host of other injured players, Ireland have struggled to rediscover the highs of that win over New Zealand, with defeat to England in the opening Six Nations game at the root of their recent malaise. But Marmion thinks their failure to deliver fluid performances is a temporary blip. “I just don’t think you can underestimate how good the other sides are. I think every team, even Italy this year, have been tough to beat especially at home. Email “Marmion ready to run with Ireland after stint on the sidelines”. Feedback on “Marmion ready to run with Ireland after stint on the sidelines”.